Nearly 700 Princetonians, including senior student-athletes and family, coaches and support staff, and Tiger alumni convened on the Princeton Graduate College last Thursday, May 26th, for the 19th annual Gary Walters ’67 PVC Awards Banquet. Several senior student-athletes and distinguished alumni were recognized throughout the evening, all while celebrating the Princeton Athletics class of 2016. Chris Perez ’16 (Wrestling) kicked off the evening with the senior student-athlete keynote address. Perez battled back from a series of knee operations throughout his Princeton career to lead the Wrestling program to new heights, including wrestling for the Ivy League title for the first time in 30 years. Chris Perez’ keynote address can be viewed here. James Agolia ’16 of the Men’s Lightweight Rowing program took home the Class of 1916 Cup, awarded to the student-athlete with the highest academic standing at graduation. The Art Lane ’34 Award, given annually to undergraduate student-athletes in recognition of selfless contribution to sport and society in memory of Art Lane ’34 by friends and family, was presented to four student-athletes from the 2016 class: Emily de la Bruyere ’16 (Women’s Cross Country/Track & Field), Anya Gersoff ’16 (Field Hockey/Women’s Lacrosse), Mary Ann McNulty ’16 (Women’s Openweight Rowing) and Josh Miller ’16 (Men’s Soccer). John Thompson, III ’88 and Clayton Marsh ’85 were recognized as the Princeton Varsity Club destinguished alumni award winners. 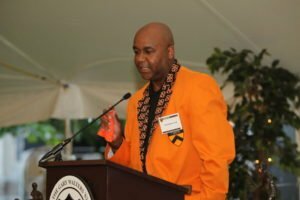 John Thompson, III, the head men’s basketball coach at Georgetown University, received the Class of 1967 Citizen Athlete Award, presented by the PVC for selfless and noble contributions to sport and society. Clayton Marsh was presented with the Marvin Bressler Award which is presented to that member of the Princeton family who, through heartfelt support of the University’s student-athletes and coaches, best embodies a belief in the lifelong lessons taught by competition and athletics as a complement to the overall educational mission. View John Thompson, III (link) and Clayton Marsh’s (link) speeches by clicking on the respective link. The night concluded with Cecilia Barowski ’16 (Women’s Track & Field) and Thomas Sanner ’16 (Men’s Soccer) capturing the department’s top honors of the outstanding female and male athletes of the year. Barowski was awarded to C. Otto von Kienbusch Award for her prowess as a record setting middle distance runner; she is set to conclude her Princeton track career at the NCAA National Championship in Eugene, OR next week. 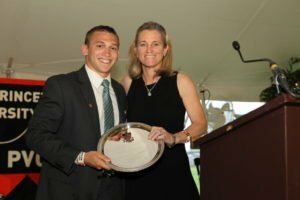 Sanner was presented the William Winston Roper Trophy for a tremendous career that included a unanimous selection as this past season’s Ivy League Offensive Player of the Year. Additional details and accolades for all award recipients can be viewed on the official Athletics’ press release here. A video tribute to all senior student-athletes, which served as the closing to the banquet program, can be viewed here.